Parents of children with autism and other special needs may feel much like the blind men in the story when confronted with the prospect of educating their child with special needs. In addition to coming to terms with the fact that their child is different, parents are faced with the prospect of learning a language that is completely foreign to them and the different theories of what is the best way to handle their child. There are so many terms to learn, that after while it looks like alphabet soup — LRE, OT, TSA, APE, IEP, IDEA, LAS and more. What does it all mean and where to start? When parents meet with school district representatives for the first time to consider an individual education program (IEP) for their child, they are faced with many confusing choices. Do they choose the least restrictive environment (LRE) over a costly private therapeutic school? Do they want their child fully included in regular classes, or enrolled in a special day class with only children with special needs? Or, should they go with the collaborative model? Classroom modifications or adaptations? Should he have a temporary support assistant (TSA) or not? Adaptive physical education (APE) and/or regular P.E. classes? 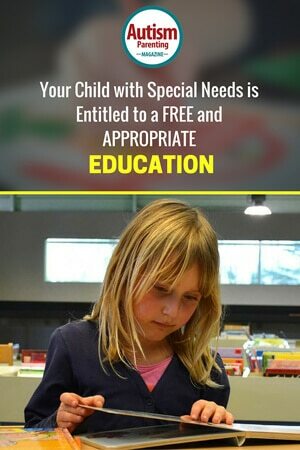 Even though the Individuals with Disability Education Act (IDEA) provides that children with disabilities are entitled to a “free appropriate public education,” deciding what is the best placement for a child with autism is almost impossible for parents to do – alone. The choice of a child’s placement is a decision parents and school district specialists should arrive at together, in agreement, after a thorough series of evaluations performed by the school district, and if necessary, private consultants as well. When a child is first diagnosed is key. There is fairly consistent agreement that intensive early intervention is the only proven method of increasing the chances that a child with autism will be mainstreamed in a general education class, which is currently the preferred model for most school districts. Many districts even provide special preschool classes for children diagnosed early. However, the reality is that many children never receive early intervention services prior to entering school. Some do not receive a diagnosis until they are already school age and others – even if diagnosed as an infant or toddler – may not receive intensive therapies due to myriad reasons including lack of resources, lack of access or availability of services. Whatever the case of when a child is diagnosed, once he is (and public schools have teams of experts who run batteries of assessments for the purpose of diagnosis), an IEP is held with the parents, school district representatives and others, such as teachers, speech therapists, etc., present to weigh in on where they believe a child would perform best in an academic setting. If the parents have hired private assessors, such as speech pathologists or therapists, these professionals are also welcome to present their findings at the IEP. Parents who educate themselves prior to an IEP have the advantage. Those who come with some knowledge about the various educational options that are available and which best suits the needs of their children can address the choices with familiarity for their individual child’s needs. No matter how much preparation is done, families can often feel frustrated with the IEP process and unsatisfied with the placements offered by their school districts. This sense of frustration can lead parents to challenge their school districts’ recommendations via a “due process” complaint. The filing of such a complaint post July 2005 requires school districts to conduct resolution sessions with the parents and a member of the IEP team. The purpose of this meeting is to attempt resolution of issues related to placement and or related services. If a mutually acceptable agreement cannot be reached at such a meeting, parents have the option of proceeding to mediation or a hearing where an administrative law judge will determine the outcome of their challenge. The acrimonious relationship that often develops between school districts and parents over appropriate placement can be avoided in some cases if the approach to placement is revisited and a greater emphasis placed on full disclosure. First, school districts and parents need to partner in the educational placement process. By definition, a partnership requires each party to respect and honor the other and for there to be an open and honest exchange of information. School districts should openly discuss the various theories and concepts related to educating children with autism. No matter if an IEP results in the ideal placement for a child, or if it’s a decision reached through mediation, placement is only the beginning of an even longer journey. Ensuring that appropriate educational goals and teaching methods are utilized can be equally if not more challenging than securing the placement. Parents are often faced with decisions that seem inconsequential, but are actually of utmost importance. Should touch math or manipulatives be used to teach addition and subtraction to my child? Should the child be pulled out of the classroom for occupational therapy (OT) or should the OT services happen in the contest of small group work? Without a strong foundation and comprehensive information, parents cannot expect to reasonably have input in such critical decisions. Likewise, parents should disclose as much information as they can about their child’s strengths and weaknesses so that an appropriate placement can be made. The “hide the ball” approach to placement where neither the school district nor the parents openly and honestly disclose critical information is not only highly inefficient, but is extremely harmful to the child. When critical information is withheld by either parents or districts making the most appropriate placement is illusory at best. To the contrary, when districts and parents understand their respective roles and the tremendous opportunities created when they enter into a true partnership, phenomenal outcomes can be achieved for children — even those with the most severe disabilities — when there is a foundation of trust, respect and full disclosure. Areva Martin is one of the nation’s leading voices in the media. An attorney, legal and social issues commentator and talk show host, she is an audience favorite on a long list of shows from Dr. Phil to AC 360. A recurring guest host on The Doctors, Areva is a regular on Dr. Drew, Good Morning America, World News Tonight, Nancy Grace, The Michael Smerconish Show, CNN International, CNN Tonight. A Harvard Law School graduate, Areva is the founding partner of Martin & Martin, LLP. She represents clients in high-stakes civil and disability rights and employment litigation. She has been identified as a Southern California Super Lawyer for the last 3 years. Recognized as one of the nation’s leading autism and children’s rights advocates, she is the founder of Special Needs Network, Inc. and the author of an Amazon best-selling book, The Everyday Advocate: Standing Up for Your Child with Autism and Other Special Needs. (Penguin 2010).